Digging through some records in my home town this week I learned that, in 1957, my parents bought four cemetery lots at Grandview Cemetery for $370, ten dollars down and ten dollars a month. I don’t know why they chose four since there were five of us in the family. Maybe two were just speculative investments. Thirty-six years later they paid the “opening” and “closing” fees of $160 each for two of the lots. Today, the same sites would sell for $1,995 and have “opening” and “closing” charges of $1300 to $1500 depending on day of the week. Weekends are more expensive. There may be an upcharge for Volunteer home football weekends. 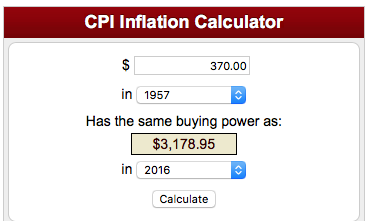 Inflation has been persistently destructive in the decades since they bought the lots, and the Bureau of Labor Statistics handy dandy inflation calculator tells me that $370 in 1957 had equivalent purchasing power of $3,179 in 2016. If a person still owned the four lots, unused, they could be sold now for $1,995 each less a $250 transfer fee charged by the cemetery or a total of $6,980 for the four lots. It could be a little more if they happened to be under a big shade tree or on a rise with a good view of the Smoky Mountains, or a bit less if some infamous characters were buried in adjacent sites. Such a transaction would have to be reported as a capital gain on the seller’s tax return of ($6,980 – $370 = $6,610). At today’s 15% rate, that would be a tax of $991. So, the initial investment of $370 would have an after-tax payback after 59 years of $5,619. Pretty impressive, isn’t it? Not really. A compound interest calculator reveals that the $370 investment brought a return of almost exactly 5% per year. But government-driven inflation averaged 3.7% per year over those same decades so the “real return” after inflation was about 1.25%, probably about like CD’s or short term bonds over that same period, better than stuffing it in a mattress but not like a good stock index. The Dow Jones Industrial Average, dividends included, before taxes and without inflation adjustment, grew 10.1% per year over that 59 years (6.2% after inflation) and the $370 would have grown to $108,000. Compare that number to the $6,610. Now that is impressive! Don’t try to make money buying cemetery lots. If we insist on taxing capital gains, we should only tax the gains in excess of inflation. If we had invested the Social Security Trust funds in a Dow Jones Industrials Index instead of spending the money and replacing it with IOU’s in the form of non-tradable government bonds, we could probably stop collecting SS taxes now and just pay all benefits from the trust fund. The government wouldn’t even have to pay capital gains taxes on the increased value. Here is a little item from goodreads.com. I always enjoy your messages and always wonder how you find the time to investigate your information. I suppose retirement allows… Good info today. I’ve always suspected your results, now you’ve confirmed… Thank you.